When you first made the decision to homeschool, you might not have been thinking about college. But now that your child is older and ready for advanced level courses, maybe even college-level courses, where do you start? There is good news, your student can take online courses for college credit. It’s easy to get started and it doesn’t cost an arm and leg. Your student can get a head start on a college degree while in high school, explore interests at a higher level, gain important college experience, and your family can save money on college costs. Gain College Experience: By experiencing what college coursework is like while in high school, students can prepare to thrive in a new academic environment and develop the study habits necessary to succeed in higher level courses. Reduce the Cost of a College Degree: Students who complete college courses while in high school can graduate with considerably less debt by accumulating credit to transfer into a degree program ahead of peers. Online college courses can be extremely affordable and flexible. StraighterLine courses, for example, start at $59 with a $99 monthly membership and include eTextbooks free. Impress College Admissions: High school students with a proven ability to succeed in college courses demonstrate the ability to handle rigorous coursework – and the drive to push themselves beyond their comfort zone. Gain Advance Standing and Complete Prerequisites: By completing prerequisites and earning college credit while in high school, students can enter their degree program with advanced standing. This means that they can advance directly to courses in their major, avoid the hassle of possible waitlists for popular prerequisites courses, and even complete their degree program a semester (or year!) ahead of schedule. Explore Areas of Interest: By exploring their academic options in a college course catalog, for example, StraighterLine offers 60+ online college courses, students have the opportunity to immerse themselves in areas of academic interest beyond subjects typically available to high school students and complete necessary prerequisites before enrolling in college and declaring a major. Every college or university will have their own transfer policy that outlines the credits that they accept and the conditions — including minimum grade standards — for transfer. The standard guideline (not a rule, every school is a little different!) for getting credit from other institutions is by earning a “C” or better in a course, but some schools will require a number grade and/or have their own definition of what makes up a “C” grade. At StraighterLine, we require that students complete all required assignments such as quizzes, exams, labs and essays and receive a 70% or above in their course in order to be eligible for credit transfer to one of our 60+ partner colleges or to request an ACE Transcript. The American Council on Education’s College Credit Recommendation Service (ACE CREDIT) helps students gain academic credit for courses and examinations taken outside traditional degree programs, including the military and online college course providers like StraighterLine. Once you have completed a StraighterLine course, your student is eligible to receive an ACE Transcript for credit transfer purposes. Over 2,000 schools consider ACE Transcripts for credit transfer, but you’ll need to work with a school’s registrar to verify if the course will transfer. 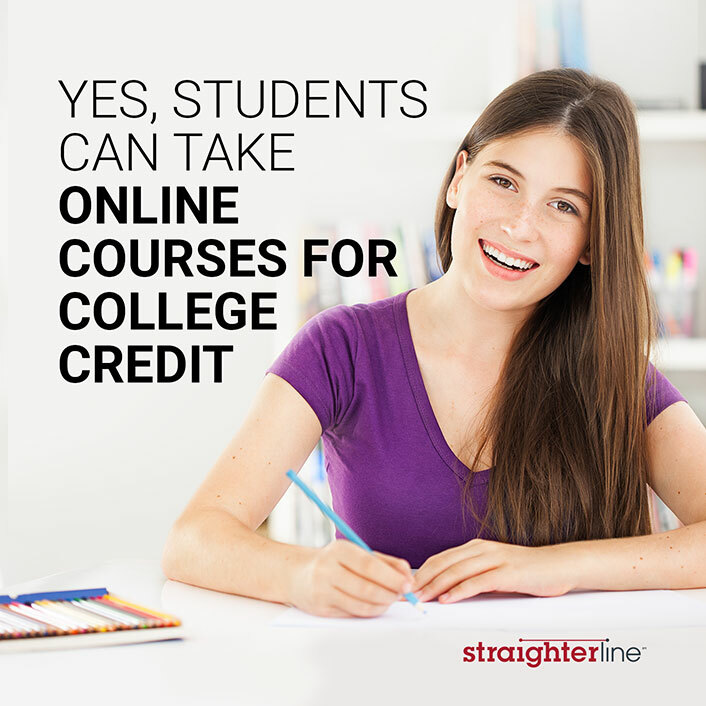 Earn college credit with StraighterLine. To get an exclusive $50 off promo code for homeschool students, use promo code HOMESCHOOLSL50 at checkout! Visit our site or give us a call today at (844) 357-5221.